Originally from County Cork in Ireland, Veronica Sexton - known as Ronnie - moved to England in 1988 in order to study at the London College of Furniture. She then earned a Higher Diploma and Graduateship in woodcarving and gilding at the City & Guilds of London Art School. She won the William Wheeler prize for outstanding work and was part of a select group of artisans chosen to work on the restoration of Windsor Castle, which had been damaged by fire. Since then she has worked on a number of commissions in Ireland, England, USA, Malaysia and Australia. She now lives in Australia. Ronnie did not learn woodworking as a child, during what she describes as a very normal Irish upbringing. She attended a Convent school which mixed academic subjects with instruction on how to be a 'good housewife' by learning cooking and sewing. Ronnie selected art as one of her honours subjects, even though it wasn't taken seriously at the school. "There were only three of us in the class, which was taught by a nun in her 70s with obvious signs of failing mental capabilities. We were left totally to our own devices. Amazingly, I did pass with a good grade." As she enjoyed making clothes for herself and her sisters, Ronnie originally wanted to become a fashion designer. However, this was not to be. "I applied to two art schools to further my studies in fashion design. To my shock, I wasn't accepted. Following that I went to London and went on a major 'sulk' for three years. Like any 18 year old, I thought it could only mean one thing - that the universe was conspiring against me! Over that time I entered many low paid, dead end jobs and always felt a great loss within me - a void. Like there was something missing, a space that needed to be filled," she explains. She returned to Ireland and enrolled on an art foundation class that covered everything: writing, jewellery, metal work, drawing, painting and wood. This was an instant success: "The very first few minutes working with wood I fell in love, it was the beginning of my 'love affair' with it, every part of me knew that I would be a carver." After this, Ronnie returned to London to take a short basic woodworking course, she then applied to The City & Guilds Art School, the only place in the UK that taught traditional woodcarving. It was a three-year course but Ronnie was accepted straight onto the second year as she was seen as a gifted student. On completing the course, she won the William Wheeler prize and was then selected to work on the restoration of Windsor Castle. Although she had enjoyed her time in England working at Windsor and in restoration workshops, Ronnie wanted to move on. 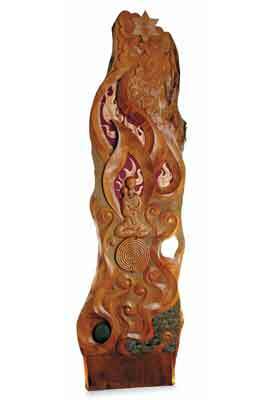 She went first to America, where she worked as a master carver, before being offered an all expenses paid job working on a private mansion in Kuala Lumpur, Malaysia. From there she went to India, where she met the head priestess of the Hindu temple in Belfast. It was agreed that she would go to Belfast to design and carve the altar, which was a two-year project. "The altar for the Hindu temple was the turning point of my career. Up to this point, I was carving for very rich people and my work was put behind closed doors. On arriving in India I started listening to my heart and I made a decision to no longer only carve for rich people. On my third day there I was standing in front of the most amazing carved altar and Gopi, the priestess I was introduced to, was standing beside me. I said to her 'do you want me to carve you an altar?'. She looked wide eyed at me and said, 'can you do that?' 'Yes', I replied. Tears filled in her eyes, she said they had been looking for a carver. So it was agreed then that I would carve them their dream altar. It was the turning point in my career that I would only ever again carve for the people, for public places, pieces that would be seen by rich and poor alike." Ronnie got married and had her first child while working on the altar. Once it was complete, she moved to Victoria, Australia. A chance encounter in Australia led to a change of direction in her work. "While driving around in the Dandenong Ranges where we live I discovered a guy, Ken, with these great big slabs of wood and we got chatting. I said I was a carver and told him about my work. A few days later he phoned me and said he would like to give me a gift of a slab. When I got off the phone I thought 'what a generous man'. The following day I went to his place to receive this generous gift. When I got there he went under his basement and pulled out a very ugly piece of wood, about 1.5m. I just looked at him thinking this must be a joke, but he didn't laugh. As I drove off I thought this man must be crazy. If it hadn't been given as a gift I would have cut it up as firewood, but I knew he would ask about it so after a few days I cleaned it up and removed the rotten part and dragged it inside. Over the next few weeks looking at it while sitting having a coffee, I slowly saw something among the knots and ugliness. I started to draw lines, then I started carving, and slowly it started to reveal itself, it was an angel." 'The Faceless Angel' was Ronnie's first sculpture and marked her turning point from traditional carving into sculpture. She quickly got on the phone to Ken and told him she wanted the biggest slab he had. This was eventually used for the first of the WoodHenge sculptures. Ronnie allowed her strict European classical training in Gothic, Baroque and Rococo woodcarving to evolve into a more relaxed and free-flowing style that forms the basis of her unique contemporary sculpture practice and the nine sculptures of the WoodHenge collection. She now predominantly works with salvaged timber from the Dandenong Ranges. This timber comes from trees that have blown down or that have died a natural death. 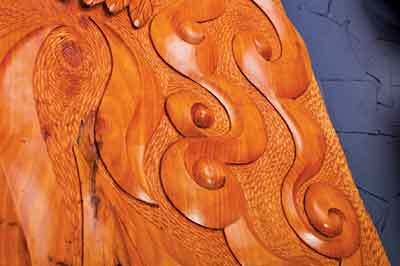 "In traditional, classical carving we always worked out the design on paper then sourced the wood. The wood always had to be 'perfect', devoid of knots or imperfections. Now, in sculpture I work completely differently. I embrace imperfections and I draw directly onto the wood. My philosophy now is working with the wood rather than making it work for me, that is why I work with knots, cracks and imperfections and incorporate them into my overall design, it's working with Mother Nature." Ronnie discovered that she could use crystals and rocks to disguise some of these imperfections, which resulted in them enhancing the piece by adding a new and vibrant energy to her work. Working in this way with wood is what she believes makes carving "inspiring and fun." Unlike traditional carving where Ronnie was restricted to mostly copy carving traditional classical styles, she goes on to explain: "In sculpture I am free to channel from the source of my creativity and in doing so, capture this essence in my work. It is this essence that touches and resonates with the viewer. I believe this is the true job of an artist and my job as a carver." Ronnie's WoodHenge exhibition is comprised of nine carvings. Each sculpture carries intricate and detailed symbolism of many cultures, continents and historical backgrounds from around the world. As a collection, they tell a full story from prehistory to the present day. They range in measurement from 3m to 4m and are adorned with hundreds of crystals, stones, rocks, glass, painted fabric and gilding. The sculptures are not for sale as Ronnie prefers that the collection stays together and travels as an exhibition. She says these nine sculptures are her favourite pieces as they represent such a personal journey for her. This was the first of the sculptures that Ronnie made, although at the time she did not plan to create a series. 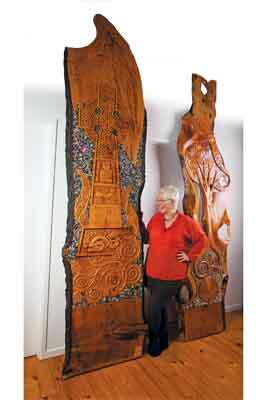 "When it came to carving the 'Celtic Cross', I returned to my ancient culture," she says. The Cross is carved in cedar (Cedrus spp.) and embellished with crystals. This piece features a Christian cross with a circle symbolising the Sun God. 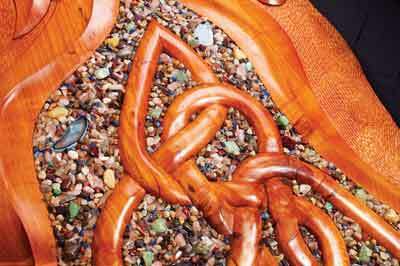 The interlacing knot work was used by the Celts as a form of meditation. Other traditional Celtic details include the human figure with an out-of-proportion head and the animal with a human head. This carving was made from cedar, rocks, acrylic paint and gold and silver gilding. 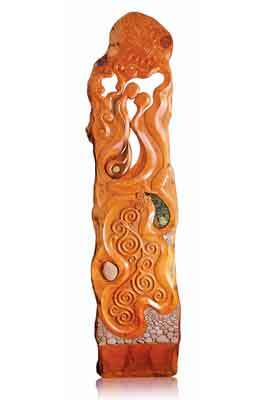 It features a carved dove, symbolic of peace and the Holy Spirit; a painted butterfly, representing metamorphosis; and a dragon, which represents ley lines. 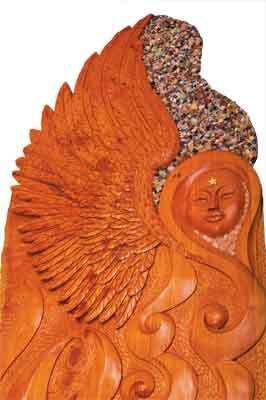 This angel figure was carved from cypress (Taxodium distichum) wood and decorated with crystals. The lower part of the sculpture features the Celtic symbol 'triquetra', which here signifies the three lunar or solar phases. 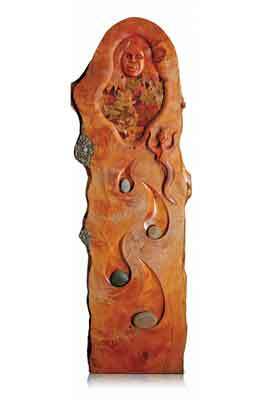 This cedar wood sculpture represents the union of male and female. 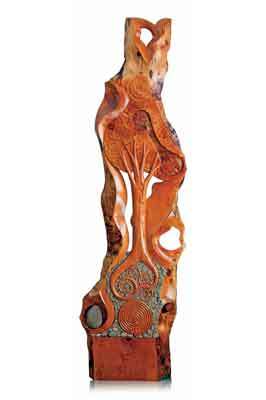 It has an organic, flowing form and is adorned with rocks and leaves set in resin. With this piece, Ronnie set out to create a universal image of a mother and child. The mother figure sits on top of a labyrinth, which is a metaphor for the soul. 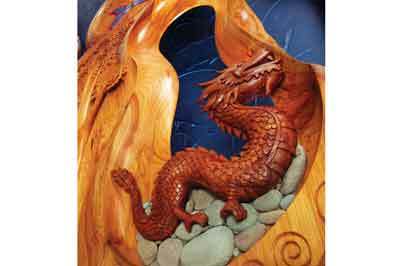 The sculpture is made from cedar wood, rocks and painted silk. Ronnie carved this sculpture as a reminder of the never-ending love Mother Earth has for us. 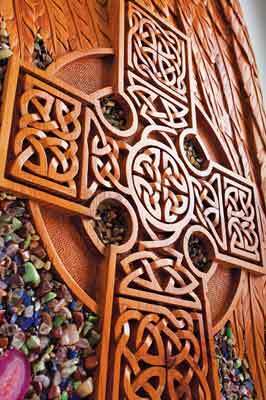 It is made from cedar wood, rocks and leaves set in resin. 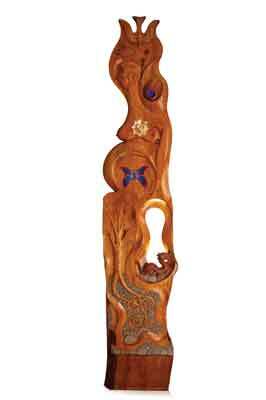 This piece was made in honour of Aboriginal peoples. 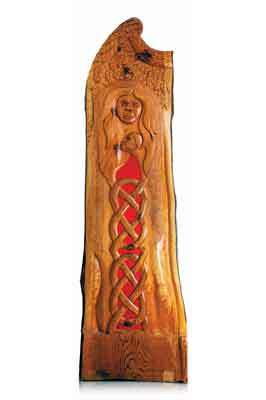 The image of the mother and child flows into Celtic knot work, combining Ronnie's Irish heritage with her interest in Australian Aboriginal culture. The sculpture is made from cedar wood and glass. This sculpture represents the rising of the divine feminine force. 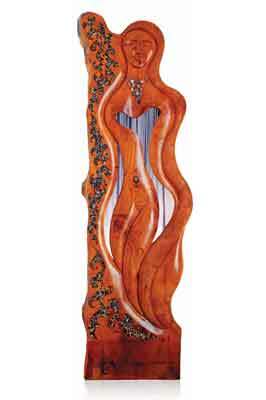 It is made from cedar wood, crystals and fabric. This piece symbolises the connecting of all forms of creation from the heavens to the earth and is a reminder to us to 'reconnect with nature'. The sculpture is made from cedar wood, rocks and leaves set in resin.